Has anyone noticed the apple logo looking different? I don't think it would light up. It just looks different if you look at the 1st generation one. Yeah might be for light up Who knows? could be in final release of iOS 11. Off the topic are you American Muslim? How does it look different? I have a 1st gen 12.9” Pro so I’m curious. Yeah might be for light up Who knows? could be in final release of iOS 11. The Apple logo doesn’t light up on any model of iPad, including the latest models. The logo isn’t translucent. Last edited by Rob Phillips; 06-19-2017 at 09:22 PM. When you look at pictures of the new ones the apple looks white not black. Might have to see it in person to find out. Also I think the light up would be in the hardware not the software. For your off topic question, the answer is yes, for 25 years now. I pulled this from https://www.apple.com/ipad-pro/?afid...33&subId2=vbim. Looks like the logo mirrors the color of the case (i.e. silver for silver, space gray for space gray, etc.). I don’t see any that look white though. Looking at the picture that you posted seems to me that their lighter in color than the 1st generation. The 1st generation seams darker than the new ones. Space gray for me. Have to go with the 12.9" one. Still undecided about either 256 or 512 on the storage. Last edited by Abu Khadija; 06-20-2017 at 08:11 AM. Gonna upgrade to 512 GB soon, 256 GB is killing me and only 1 GB left. Wow. I thought with me having 128gb on the 1st gen 12.9" and only about 50gb left was trouble. What do u have that's taking up space? Movies? Yeah I'm an iTunes buyer, Usually buy movies/music and TV shows via that, Each movie (720P) takes up size around 4 GB and each TV season will be about 17 to 30 GB. iPad Pro is such a great device for watching, Dislike TV itself. Moreover, Don't forget the magazines if you have some subscriptions. Size of most magazines are 300 to 600 MB nowadays and the more magazines end up more storage size. It looks like Best Buy will have the new 12.9" iPad Pros available next week. Seems the 256gb is not available. Might have to get the 512 on At&t next. 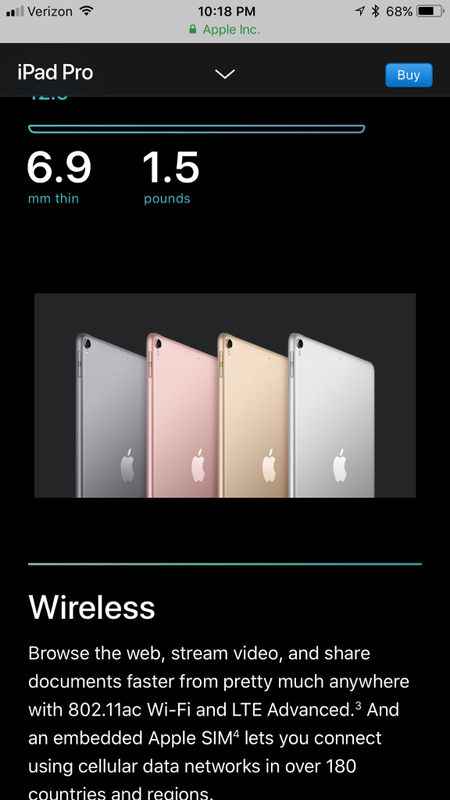 Updated: It seems like the 256gb versions with cellular are not available for pickup. The wifi versions seem to be there. Fully specced Macbook 12'' a good idea? Should you buy the new 2017 iMac?